The Swiss Army Knife for the gigging musician. BRAND NEW COMPLETE WITH POWER SUPPLY. EDB-2 Comprehensively packed with practical and effective sound crafting features: Twin channel with individual inputs & gain controls. 5 Band EQ assignable to Channel 1, 2 or both. Notch Filter assignable to Channel 1 or 2. 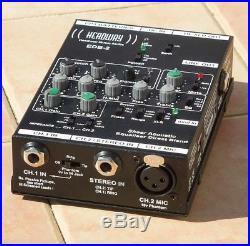 Huge 0-32 dB Gain to interface with most mixers/desks etc. Phantom Power is assignable to either ring or XLR to power virtually all instrument microphones/pickups. Phase Reverse assignable to each channel. 3 Way Input Impedance selector for each channel. Range Switch tuned for specific instruments i. IPod Input for backing tracks, practice routines etc. 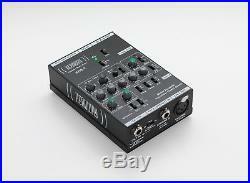 Mono, Stereo & XLR Inputs, Jack and XLR Outputs. Battery or Mains powered (power supply included). 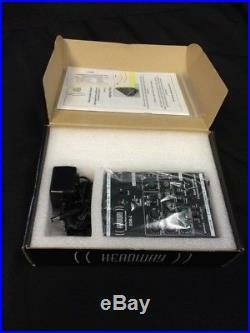 PRESS RELEASE Multi-Function Pre-Amplifiers: EDB-2 & EDM-1 Headway Music Audio Ltd. Proudly presents two new additions to their range of Acoustic Pickups & Pre-Amplifiers. After the success and 5 star reviews of the EDB-1 Equaliser Direct Blend Pre-Amp, Headway, having listened to customers feedback have replaced it with a much improved successor: The EDB-2 and an all new mini version: The EDM-1 Both units boast Refined Class "A" Inputs and Pro Audio IC Components, easy to read Pro-Audio design layout & sturdy metal housings built to withstand Life on the Road. Both are supplied with belt clips, rubber feet and are threaded for microphone stands. The item "Headway EDB-2 Acoustic Pre-amp Guitar, Violin Bass etc" is in sale since Friday, February 16, 2018. This item is in the category "Musical Instruments\Pro Audio Equipment\Preamps". The seller is "sccomponents" and is located in Burton Upon Trent, Staffordshire.